Enjoy Spicy Mexican Bean Dip two different ways! 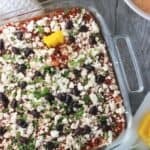 Perfect for Game Day munching, Hot Pepper Jack Bean Dip will satisfy your creamy, cheesy cravings, and Spiced Up Mexican Seven Layer Dip is a fresh take on a classic. Add all ingredients to a sauce pan set over low-medium heat. Stir to break up the cream cheese and beans, and then stir every now and again as the cheese melts. Dip is ready when it's mostly smooth and heated throughout, about 10-12 minutes. Serve warm! Spread refried beans in an even layer in a serving dish. I used an 8x8" clear dish so the dip wouldn't be too tall and you can see the layers. Cut and scoop the flesh of the two avocados into a bowl. Add smoked paprika and salt and mash everything together with the back of a fork until the mixture is cohesive but still a bit chunky. Spread spiced avocado mixture evenly over top of the refried bean layer. In a separate bowl, stir together sour cream, chili powder, ground cumin, and garlic powder. Add sour cream in an even layer over top of the avocado. Sprinkle the diced jalapeno pepper over top of the sour cream, using more or less jalapeno to adjust the spice level to your taste. Evenly spread black beans as the next layer over top of the jalapeno pieces. Pour Pace® Chunky Salsa over top of black beans and spread until even. Top with crumbled queso fresco, chopped cilantro, and additional black beans if you like. Serve cold! I used a clear 8x8" (2 qt.) dish for the Spiced Up Mexican Seven Layer Dip so that you could see the different layers. I suggest using a wider, shallower dish than a standard serving bowl. This way the dip isn't so tall and you have a better chance of scooping up multiple layers at once onto your chip! I err on the side of caution and wear disposable, powder-free gloves when chopping jalapeno peppers so that I don't burn my fingers. The Hot Pepper Jack Bean Dip can be made ahead of time and then reheated for serving. Because of the avocado in the Spiced Up Mexican Seven Layer Dip, I suggest preparing it soon before serving. Feel free to scale up/down the quantities of ingredients here to yield a smaller or larger quantity of dip(s).